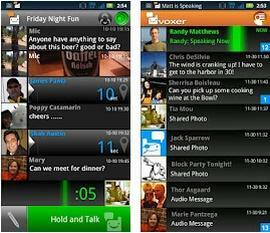 Today we have news of the brilliant Voxer android Walkie-Talkie PTT app for smartphones that allows users to turn their handset into a walkie-talkie, which is also packed with features allowing users to easily communicate with their friends. The push to talk application is extremely versatile that functions primarily like a walkie-talkie, and can stream fast audio messages to your Voxer contacts and users have the option of either having a one-to-one conversation with someone, or you can start a group conversation. There is also the option to send instant messages or even photo messages if you don’t want to use the walkie-talkie function. First you have to download and sign up for the app and create a profile, you then search for contacts or invite them to join the service. To begin chatting via the walkie-talkie takes a simple tap on a contact and pressing the ‘Hold and Talk’ button, then say your message and release the button. Your message has been now sent to your contact and if they are available they can join you in a conversation, or retrieve the message later by opening up the app. If you would prefer to send a photo message you just tap on the icon and can send an image via your gallery or capture a new one via the app itself. You can connect with your Facebook friends on Voxer and the app works via Wi-Fi, 3G, 4G, and EDGE, and as the application is cross platform you can talk with your friends on both the Android and iPhone platforms. All of the applications features are free to use and there are even no ads getting in the way, and users that have already downloaded Voxer have given the app favourable reviews. Head over to Google Play to find out more and to download.